To make the use of the "soft" function easier, the diaphragm in this lens operates in a stop down manner in the range f/2.8 ~ f/5.6 and as automatic in the range f/5.6 ~ f/22. 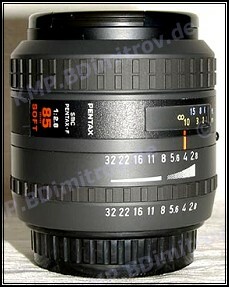 This is the only change Pentax made despite of the outer cosmetics around the focus scale window. However, this has some consequences. On both lenses there is a fading soft effect from f2.8 to about f6.7. The soft effect also depends on the scene, since there is always core sharpness at any aperture especially at the darker and high contrast parts of the image, while the soft effect takes place on the highlights and brighter parts of the image. This means, that depending on the scene the soft effect disappears somewhere in the range f5.6 to f8. The old F 85mm soft was able to show a sharp picture in the viewfinder when set at the auto aperture range from f5.6 to f22 in "sharp" mode. The new FA 85mm in contrast shows a slightly soft image all the time, even when "sharp" mode is chosen. This is a bit confusing, unless one has a DOF preview to check the real image. So why did Pentax change this? The answer is converter usage. The FA 85mm works great with the 1.4x-S converter, making a 120mm lens with 1:3 macro capability. The old version will create a rather dark viewfinder due to f8 resulting as the auto aperture value. The new version will have f6.3 as the auto aperture value, and combined with todays bright viewfinders this is a comfortable value. So the old F version is better for the use as a real soft effect lens, since the viewfinder image even without DOF control is very close to the outcome on the negative. The new version in contrast overdoes the soft effect in the viewfinder a bit, but it is better for use with teleconverters in sharp mode. It is important to note that both lenses have no "A"-setting and may not be used with the MZ-30 bodies. MZ-50 will show correct metering only in the soft range of the stop down apertures. In the sharp auto range the meter of the MZ-50 will underexpose.